There are few more comfortable places, on a cold winter night, than sitting by a fireplace, enjoying the warm glow and flicker of the flame. Gas Fireplace Inserts make it easy to just sit down, and click the remote control. No Muss, No Fuss! Sit back and enjoy the elegance and beauty of a Gas Fireplace Insert. No more cold drafts. No more mess. Just a handy remote control at your side to bring warmth when you want it. Today’s Gas inserts provide realistic flames, high efficiency heating, and are ideal for providing heat when the power goes out. Lighting features create ambiance without the heat, and enhance the view with the heat on. Direct venting, eliminates drafts and heat loss, and increases efficiency, while electronic ignitions eliminate the waste of a constantly operating pilot light. Gas Fireplace Inserts operate on Natural Gas, or Propane. Installation of Gas Fireplace Inserts is generally straight forward, and completed within a day. With almost limitless ability to customize the look, gas fireplace inserts can add contemporary or traditional style to your living space. By installing a gas insert, you can transform that old out dated fireplace in a day, then sit back and enjoy! Visit one of our two fireplace stores in Ottawa or Carleton Place, where you will find many operational gas fireplace inserts on display, so you can see how your new gas insert will enhance the beauty and enjoyment of your home. Our fireplace experts will provide options that are sure to meet your requirements and budget. Gas Fireplace Inserts with Low Monthly Payment Options are also available, so you can begin to enjoy your new Gas Insert right away. Various fireplace sales and promotions run all year long! Call Top Hat Today for a free in home consultation on the best gas fireplace inserts for your home. Escape inserts with patented, heat-radiating FireBrick® material. See the Escape I35 Gas Fireplace insert operating in our Ottawa Fireplace Showroom. 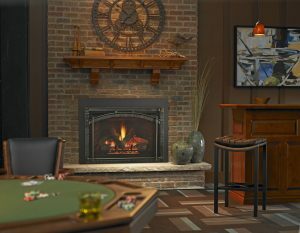 The Grand-I35 Gas Fireplace Insert – A simple and classic upgrade to your existing wood fireplace. No more drafty, dated fireplaces. No more messy maintenance. No more soot and smoke. The Enviro Large Gas Fireplace Insert is ideal for those large wood fireplaces. Versatile Gas Fireplace insert that fits into fireplaces many others won’t. Easy operation gas fire insert with IntelliFire Plus auto-ignition system. Define your favorite room with classic styling—and impressive technology. Gorgeous flames and easy operation with the IntelliFire™ Plus auto-ignition system. The QFI35FB offers classic styling with impressive technology.